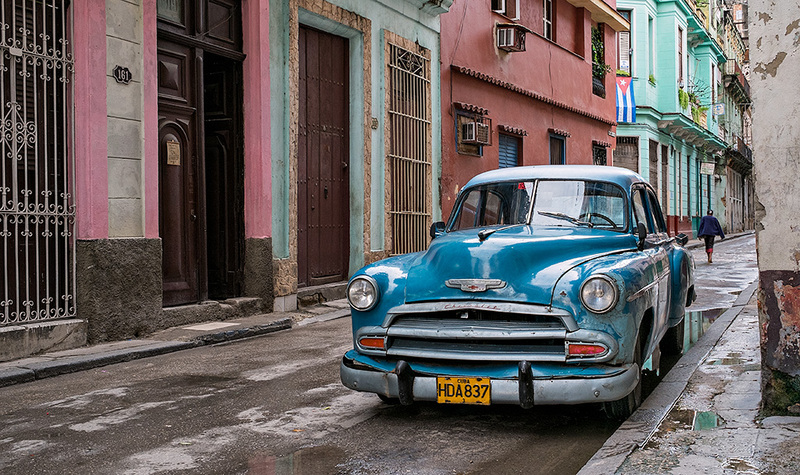 On our first day we stumbled upon this wonderful car on a great street in old Havana. The recent rain added just the right touch. For processing, I used Alien Skin Exposure 5 and in this case was done! 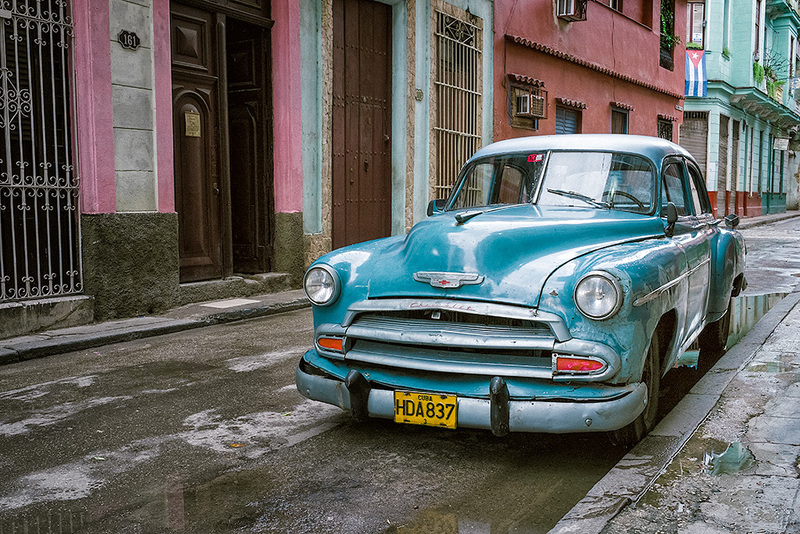 I think the film look for images from Cuba is perfect and Exposure 5 rocks for ease of use. And, you can customize the look right in their awesome interface too. I have a video tutorial for Exposure 5 here. A thought with regard to the process of image capture. When you stumble upon a scene as good as this or one the resonates with you for whatever reason, WORK THE SCENE!! Do not just take one picture and walk away. Below you’ll find two more takes. Two more right answers but ultimately I liked the lead image best. I took one at a different angle and the other without the wall on the right. Notice the different color in the last one. Different film choice in Exposure 5.
wow…love this image and how you processed it…guess I’m going to have to check out Alien Skin exposure now…like I don’t already have enough software…LOL. Thanks Betty, but you are sooooo good at processing already! Not sure any software will make your images any better than they already are! That said, Exposure 5 is very good. They are all great, but I think I prefer the bottom image for the composition. BTW … nice touch with the flag in th BG. 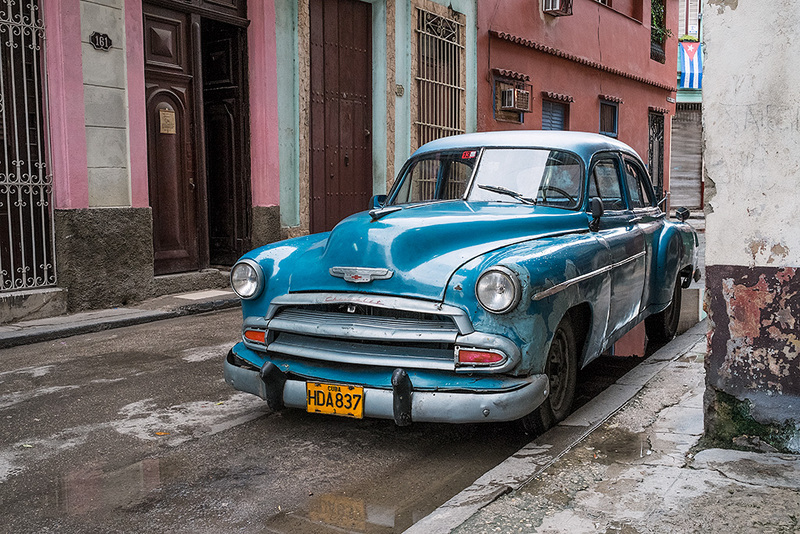 When time stood still… Makes you wonder… and is nice to see these old classics still being driven daily. Awesome x3!!! As you mention, I too like all three and prefer the lead image mainly for the angle, the person in the distance, and reflections in the fresh rain. The fresh rain polished shine is awesome. I can see a fourth image in this as well (ie: to include more of the view down the sidewalk on the right and view down the street), but assume there was some distracting elements. Including the flag is an awesome touch as well. Thanks for sharing the subtle effects that Alien Skin Exposure 5 offers to make your post process work easier, fun and to bring the look you visualized the image to have.